Join us Friday, October 19 as we honor WWII veterans with a special evening of food, song and fellowship on board the USS Yorktown at Patriot’s Point. Meet special guest Herb Griffin, who stormed Utah Beach on June 6, 1944, as well as his brother Ed, an Army engineer. ith its old-world charm and its blend of Old South, French and Victorian cultures, historic Charleston is one of the most transporting and inspirational cities for studying the providence of God and the sturdy, genteel souls that called South Carolina their home. Join us October 16-19 as we rediscover the landmark history that has made Charleston and this nation unique and great. Bill Potter will, as in all our tour stops, teach the history of Charleston from a providential biblical perspective, bringing his unique gift of storytelling to bear in a way that will inform, enlighten and entertain the youngest to the oldest of every family. We will begin our tour with a visit to Ft. Moultrie. We will stand on the ramparts as Mr. Potter paints the picture for us of the glorious defeat of the British by amateur American gunners behind their Palmetto barricades in June of 1776. We will visit three of Charleston’s most beautiful and historic churches—St. Philip’s Episcopal Church, St. Michael’s Church and the Huguenot Church. You will hear the soul-stirring stories of men like the Reverend Dr. John Girardeau, a Calvinist of Scottish and French Huguenot descent and minister of the controversial mixed-race congregation, Zion Presbyterian Church of Charleston. As we explore the grounds of these churches we will also have the opportunity to visit the graves of such South Carolina notables as Charles Cotesworth Pinckney and John Rutledge. Completed in 1771, the Old Exchange Building is a Charleston landmark and the site of some of the most important events in South Carolina history. Over the last two and a half centuries, the building has served as a British prison, a venue for entertaining George Washington, a slave market, a meeting place where South Carolina ratified the US Constitution, a post office, city hall, a military headquarters and much more. A short ferry ride into the harbor will take us to a tiny island where we will tread the very bricks and mortar where those fateful shots were fired in April 1861 at Fort Sumter, a bastion of historical controversy. On February 17, 1864, the H.L. Hunley became the first successful combat submarine in world history with the sinking of the USS Housatonic. After completing her mission, she mysteriously vanished and remained lost at sea for over a century. For decades, adventurers searched for the legendary submarine. We’ve booked a private tour of the unique research facility that is working to unlock the mysteries of the Hunley since its recovery in 2000. Magnolia Cemetery first opened in 1850 on the land of a former rice plantation. The property was designed during a new rural cemetery movement that crossed from Europe to America in the mid-19th century. With lovingly landscaped paths and ponds, trees and green space, Charlestonians would come to Magnolia to picnic and play, as well as visit lost loved ones. Today, Magnolia Cemetery continues as one of the best and most beautiful examples of rural and Victorian cemetery design in the U.S. A “who’s who” of Charleston and South Carolina history is buried here. We will visit the churches pastored by great preachers who brought the Gospel to the black and white population of ante-bellum Charleston and view the ruins of a church burned in two different centuries for much the same reasons. We will witness the casual elegance of a culture gone with the wind at Boone Hall Plantation and discuss the realities and vicissitudes of a slave-based culture. We will spend Friday afternoon exploring this wonderful naval and maritime museum on Charleston Harbor that boasts the World War II aircraft carrier, the USS Yorktown as its centerpiece. It’s also home to the Patriots Point Museum, a fleet of National Historic Landmark ships, the Cold War Memorial, the official Medal of Honor Museum, and much more. We will conclude our tour with a patriotic dinner to honor WWII soldiers with special guests Herb and Ed Griffin onboard the USS Yorktown! What better way to conclude our tour than with a patriotic dinner to honor WWII soldiers with special guests Herb and Ed Griffin onboard the USS Yorktown! * Register all Adults first. Any family members after the first 4 people to register qualify for Additional Family member price. ** Includes admission to Patriots Point and Veterans Dinner. 11 miles ≈ 25 mins. 0.4 miles ≈ 2 mins. * Parking garages—both $1 per 30 minutes: 140 E. Bay St. or 90 Cumberland St.
7:00pm “Drop-in” dinner at Comfort Suites. Bring your own food and join Bill and Kevin for fellowship and discussion of the day’s topics! 9.0 miles ≈ 16 mins. 9.0 miles ≈ 18 mins. 2.4 miles ≈ 10 mins. 70 miles ≈ 85 mins. 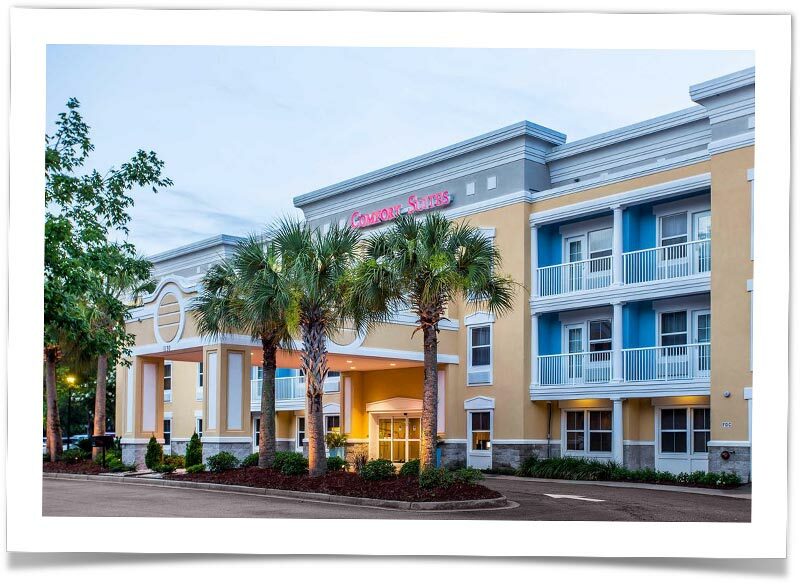 Bill Potter and I will be staying at the Fairfield Inn (2540 North Forest Dr) in North Charleston. There is no special block set aside for us, but as of September 5, rooms with two queen beds were going for $122 per night and included breakfast, parking and internet. Rooms have a microwave and fridge. Same room with AAA is $108. We did reserve several rooms with two queen beds and a sofa bed for arrival Monday, Oct 15 and departure Saturday, Oct 20 at a rate of $112 per night plus tax, so let us know if you would like one of those. We will host optional after-dinner discussions and fellowship with Mr. Potter at the hotel on Wednesday and Thursday evenings. You are welcome to stay wherever suits you best in Charleston and are more than welcome to join us Wednesday and Thursday evenings. For your convenience, we have secured a block of rooms at the Comfort Suites should you choose to stay there. The rate is $99 per night for a room with a king bed and sofa sleeper or two queens and a sofa sleeper, including complimentary breakfast, parking and wi-fi. This special rate is good while rooms last or under October 1, whichever comes first. Use discount code IR94E3 to reserve your room online at ComfortSuites.com.